Did you miss Mass Observation Diary Day on May 12? Here’s the history: In 1937, on the day of George VI’s Coronation, a Mass Observation Day was held across the UK, with citizens invited to record their daily experiences. The result was the Mass Observation Archive, which ran an annual observation day on May 12 until the 1950s. It was revived in the 1980s by the University of Sussex. 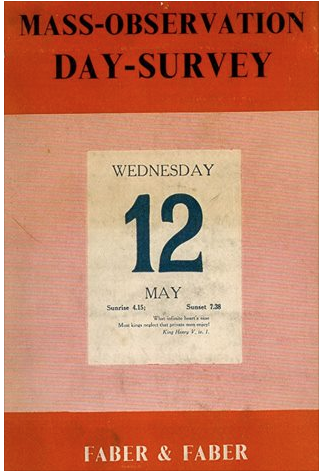 This year’s Mass Observation Diary Day was enhanced by social media: an invitation to submit diaries via email or to upload digital photographs, the Twitter hashtag #12May15, a Facebook page, and a resulting Storify page. The archive collected over these many years is open to scholars, and I can think of so many ways that it will enhance our understanding of the everyday lives of ordinary people. Bravo!